The practice of verification is grounded in mathematics highlighting the fundamental nature of its practice. 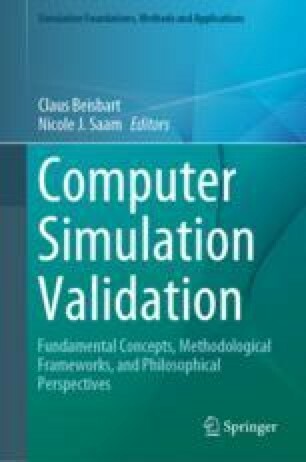 Models of reality are fundamentally mathematical and verification assures the connection between the modeling intended and achieved in code. Code verification is a process where the correctness of a computer code for simulation and modeling is proven. This “proof” is defined by the collection of evidence that the numerical approximations are congruent with the model for the physical phenomena. The key metric in code verification is the order of accuracy of the approximation that should match theoretical expectations. In contrast, solution verification is an aspect of uncertainty estimation associated with numerical error in simulations. Solution verification uses many of the same approaches as code verification, but its principal outcome is an estimate of the numerical error. The order of convergence is a secondary outcome. Together these two practices form an important part of the foundation of quality and credibility in modeling and simulation. The author would like to thank Tim Trucano, Vince Mousseau, Patrick Knupp, Bill Oberkampf, Chris Roy, Greg Weirs, and Patrick Roache for numerous discussions and informative suggestions. The DOE ASC V&V program has provided support for the development of the verification methodology. Sandia National Laboratories is a multi-program laboratory managed and operated by Sandia Corporation, National Technology and Engineering Solutions of Sandia, LLC. Operated for the United States Department of Energy by National Technology and Engineering Solutions of Sandia, LLCDE-AC04-94AL85000. Below, I briefly describe the characteristics of each type of benchmark documentation (could be called artifacts or meta-data) associated with a code verification benchmarks. These artifacts take a number of concrete forms such as a written document, computer code, mathematical solution in document or software form, input files for executable codes, input to automatic computer analysis, output from software quality systems, among others. While all of these will not typically exist, a subset of these documents should be available to support any questions or concerns about the verification problem or its implementation. Detailed technical description of the benchmark (report or paper): This can include a technical paper in a journal or conference proceeding describing the benchmark and its solution. Another form would be a report informal or formal from an institution providing the same information. Analysis of the mathematics (report or paper): For any solution that is closed form, or requiring a semi-analytical solution, the mathematics must be described in detail. This can be included in the paper (report) discussed previously or in a separate document. Computer analysis of solution (input file): If the mathematics or solution is accomplished using a computerized analysis, the program used and the input to the program should be included. Some sort of written documentation such as a manual for the software ideally accompanies this artifact. Computer solution of the mathematical solution: The actual computerized solution of the mathematical problem should be included in whatever form the computerized solution takes. This should include any error analysis completed with this solution. Computer implementation of the numerical solution: The analytical solution should be implemented in a computational form to allow the comparison with the numerical solution. This should include some sort of error analysis in the form of a report. Derivation of the source term and software implementation or input: In the case of the method of manufactured solutions, the source term used to drive the numerical method must be derived through a well-defined numerical procedure. This should be documented through a document, and numerical tools used for the derivation and implementation. Computer implementation of the source term (manufactured solution): The source term should be included in a form amenable to direct use in a computer code. The language for the computer code should be clearly defined as well as the compiler and computer system used. Grids for numerical solution: If a solution is computed using another simulation code all relevant details on the numerical grid(s) used must be included. This could be direct grid files, or input files to well-defined grid generation software. Convergence and error estimation of numerical solution: The numerical solution must include a convergence study and error estimate. These should be detailed in an appropriately peer-reviewed document. Uncertainty and sensitivity study of numerical solution: The various modeling options in the code used to provide the numerical solution must be examined vis-a-vis the uncertainty and sensitivity of the solution to these choices. This study should be used to justify the methodology used for the baseline solution. Numerical analysis theory associated with convergence: The nature of the convergence and the magnitude of error in the numerical solution must be described and demonstrated. This can take the form of a complete bibliography of readily available literature. Code description/manuals: The code manual and complete description must be included with the analysis and description. Input files for benchmarks and auxiliary software: The input file used to produce the solution must be included. Any auxiliary software used to produce or analyze the solution must be full described or included. Unusual boundary conditions (inflow, piston, outflow, Robin, symmetry,): Should the benchmark require unusual or involved boundary or initial conditions, these must be described in additional detail including the nature of implementation. Physics restrictions (boundary layer theory, inviscid, parabolized Navier–Stokes,): If the solution requires the solution of a reduced or restricted set of equations, this must be fully described. Examples are boundary layer theory, truly inviscid flow, or various asymptotic limits. Software quality documents: Of non-commercial software used to produce solutions, the software quality pedigree should be clearly established by documenting the software quality and steps taken to assure the maintenance of the quality. Scripts and auxiliary software for verification: Auxiliary software or scripts used to determine the verification or compute error estimates for a software used to produce solution should be included. Source code: If possible the actual source code for the software along with instructions for producing an executable (makefile, scripts) should be included with all other documentation. A full mathematical or computational description of metrics used in error analysis and evaluation of solution implementation or numerical solution. Verification results including code version, date, and other identifying characteristics: The verification basis for the code used to produce the baseline solution must be included. This includes any documentation of verification, peer-review, code version, date completed and error estimates. Feature coverage in verification: The code features covered by verification benchmarks must be documented. Any gaps where the feature used for the baseline solution are not verified must be explicitly documented. Here are the necessary data requirements for each category of benchmark, again arranged in order of increasing level of documentation required. For completeness each data type would expected to be available to describe a benchmark of a given type. Common elements for all types of benchmarks (it is notable that the use of proper verification using an analytical solution results in the most compact set of requirements for data, manufactured solutions also). Highly accurate numerical solution (not analytical), numerical benchmarks or code-to-code comparisons.